Anand and Carlsen are now level at one point each. The first game between the par also ended in a draw on Saturday. 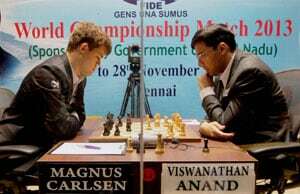 Defending champion Viswanathan Anand was caught off guard by a surprise opening from Magnus Carlsen of Norway as he played out a tame draw against his challenger with white pieces in the second game of the World Chess Championship in Chennai on Sunday. World number one Carlsen showed that he was made of sterner stuff and pulled back the attention on himself with an easiest of draws against Anand, who played with his first white in the match. The first game, in which Anand played with black pieces, was also a drawn affair on Saturday. The scores are now tied 1-1 after two games and there are 10 more games to go under Classical time control in this Rs 14 crore prize money championship. Just like Anand's mesmerising work in the opening game on Saturday, it was Carlsen all the way as Anand could not do anything. "It's my turn to offer a slight apology today," Anand said after avoiding any undue risk that might have led to wild complexities out of a Caro Kann defense. The local hero agreed that the opening was a surprise for him and even more the variation chosen by Carlsen. It was a repetition of a game played by Anand against Chinese Ding Liren some time back and Anand spent a lot of time thinking about various complicated variations but could not be sure of himself. The easier way out was to play solid, as Carlsen did when posed with slightest difficulty and the draw was up for grabs for the Norwegian. While the first game lasted just 16 moves, this one went on till the 25th but the result of the game had been forecasted by many much before that. In the post match chat, Carlsen said white could have avoided the queen exchange to have a game on, but his later analysis proved that there was not much hope for white even though it looks optically it looked like a decent option. Like in the first game, white spent more time on the clock. Carlsen ended up spending just 25 minutes on the clock while Anand took 42 minutes to make his moves. If the deadlock continues and the scores are still tied after 12 games, games of shorter duration will be played to determine the winner. Praising the world number one grandmaster, Anand said that Carlsen was the toughest opponent he has faced so far in his career. "Carlsen is my toughest opponent so far. I decided to be a little bit prudent today. 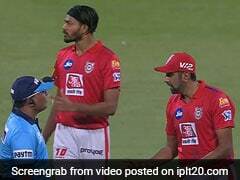 We both have a bit of info about what the other person is aiming for," Anand told reporters in the post-match press conference. On the other hand, Carlsen said Game 2 wasn't too dissimilar from the Saturday's opening duel. "I feel it was a little but similar to my earlier game," Carlsen said. When asked about the 12-game system, both players refused to comment.